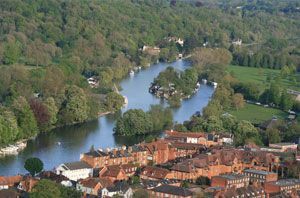 Henley on Thames is a pretty riverside market town on one of the most beautiful stretches of the River Thames, in gently wooded, rolling countryside. 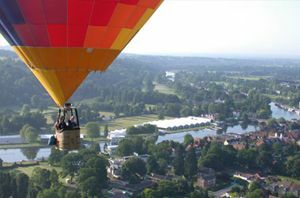 About an hour's drive from London and close to the M4 and M40 motorways makes it ideal for a hot air balloon flight or for a long weekend away for our passengers living on the west side of London. The town's history dates back to the 12th market granted by King John around 1269. The town is surrounded by large country houses built by the rich and famous since the 17th Century. One of these is Fawley Court. Designed by Sir Christoper Wren, its gardens were subsequently landscaped by Capability Brown. Temple Island which sits in the middle of the Thames just opposite was originally built as a fishing lodge for the main house. 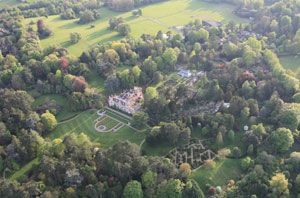 Another landmark often visible on hot air balloon rides from Henley is Friar Park, saved from demolition by its purchase in 1970 by the Beatle George Harrison. A 120 room neo-Gothic mansion from the Victorian era, it was built for the eccentric in lawyer Sir Frank Crisp and is visible when our balloons take off from nearby Swiss Farm. 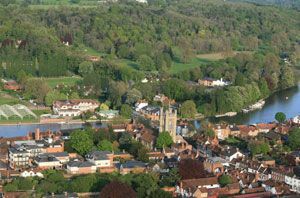 Henley is best known because of its links to rowing through the Henley Royal Regatta, first established here in 1839 because of the straight part of river known as the Henley Reach. 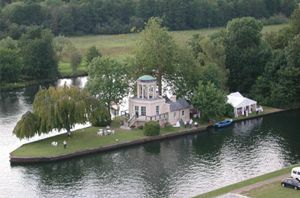 It also hosts the Henley Festival of Music and the Arts in July and has been used as a location for many films and TV series, in particular the Midsummer Murder series. It also has some fine houses open to the public nearby including Stonor Park and the National Trust properties of Nuffield Place and Greys Court. 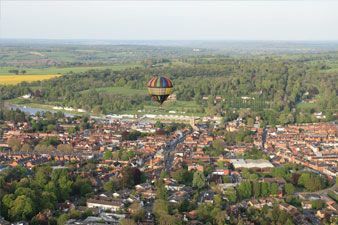 Book now to go ballooning in the Henley on Thames area. 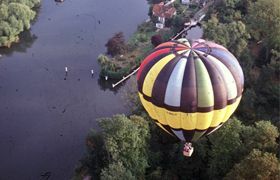 Please be aware that our balloon rides from Henley on Thames have to keep clear of Heathrow Airspace which starts just a few miles East of the town. To provide you with a safe and enjoyable flight, the site chosen will depend on the wind direction and speed on the day. 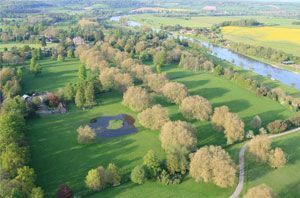 While our sites in the Henley area will be our first choice we may need to use our back up balloon launch sites around Wallingford or Reading and then hopefully fly back towards the Henley area. 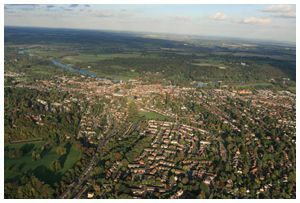 See the pictures below with aerial views taken on our balloon flights over Henley on Thames and the surrounding area. 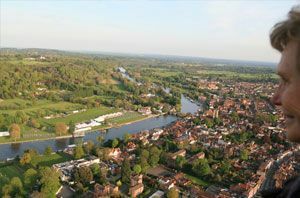 Aerial picture of Henley Regatta in full flow on the River Thames at Henley upon Thames on a balloon flight. 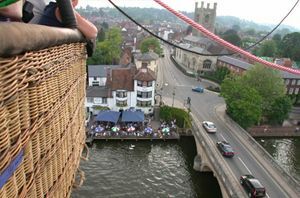 Drifting in a hot air balloon over the River Thames at Henley on Thames in Oxfordshire. Friar Park, the home of Beatle George Harrison Aerial view from our balloon.